20/07/2018 - Every year, the Biobest North America team meets up in Columbus, Ohio in July for the largest ornamental trade show of the year, Cultivate. Cultivate provides opportunities for the Biobest team to network, to learn from others in the industry and to teach others about biological control agents and the products Biobest has to offer. 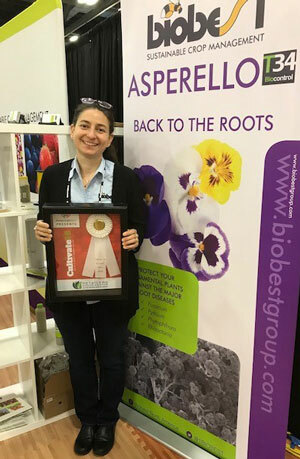 This year, Biobest’s product ASPERELLO™ T34 Biocontrol was selected and voted by independent garden centers for attribution of the 2018 Retailers’ Choice Award. Veronica Cervantes, Product Manager for Microbial products, accepted the award on behalf of Biobest. ASPERELLO™ T34 Biocontrol contains the beneficial fungus, Trichoderma asperellum T34. When applied preventatively, ASPERELLO™ T34 can protect ornamental crops against commonly occurring root diseases including Fusarium, Pythium, Phytophthora and Rhizoctonia. It is a privilege to be grouped among the best products the industry has to offer. In such a dynamic industry, we continue to strive to find relevant solutions to help growers succeed. This award demonstrates Biobest’s continued commitment to product innovation. ASPERELLO™ T34 belongs in every ornamental operation, and we are delighted that the industry feels the same way. It is the greatest award to be recognized by those who we seek to serve.